Nominating Committee Chair Michael Daggett has requested State Boards submit to NASBA their nominations for NASBA Vice Chair 2012-2013 by Friday, March 2, 2012. Under Article IV, Section 3 of NASBA’s Bylaws, to be eligible to serve as Vice Chair, an individual must have served as a Director-at-Large or Regional Director for at least a year, but need not be a current member of the NASBA Board at the time of his or her election. The candidate who is elected NASBA’s Vice Chair 2012-13 at the 2012 NASBA Annual Business Meeting will accede to Chair 2013-2014. 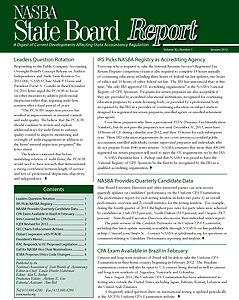 State Accountancy Boards are asked to send their recommendations, along with a current resume for each individual nominated, to Nominating Committee Chair Daggett at NASBA, 150 Fourth Avenue North – Suite 700, Nashville, TN 37219-2417. Nominations can be faxed to (615)880-4291 or e-mailed to aholt@nasba.org. Questions about the election process should be directed to Anita Holt at (615)880-4202.